This page is meant to inform individuals on the subject pertaining to weight distribution hitches. Discussed below are the manufacturers and their array of products regarding this subject. Various features are discussed as well as any included devices, parts, or mechanisms that may enhance or make each product unique to its manufacturer. Blue Ox, Eaz-Lift by Camco, Curt, Equal-i-zer by Progress manufacturing, Reese, and Ultra-Fab are the brand that will be discussed. Utilizing the latest in Weight Distributing technology is the Sway Pro. Trailer sway is minimized while towing heavy loads, enduring high winds, and traveling over rutted roads while taking advantage of the 4 points of adjustment allowing you to set the amount of control required for your specific cargo or driving conditions. The latching tongue bracket operation is much easier to use than traditional methods due to being automatic. The bracket lock, at the simple push of a lock pin, secures into place and releases automatically. After witnessing the Sway Pro's capabilites, you can be sure of our commitment to quality and durability. Eaz-Lift Pro Star is the newest trunnion style weight distributing hitch design on the market. Streamline bar design; providing an ample amount of clearance for the ball mount and trunnion; sacrificing no ability for turning. Bar locking mechanisms are spring loaded and provide security. Included ball plates are dual sway controlled and integrated to allow accessibility for tightening the nuts on the hitch ball. The elevated ball washer provides coupler clearance while grease fittings enable lubrication eliminating the need for spring bar removal which increases hitch life! The Eaz-Lift Pro Star is covered in a powder coat for an extended life and is avaiable with or with out shank and distributes 550lb or up to 1200lb. 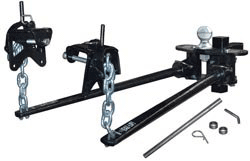 Eaz-Lift equalizing round bar weight distribution hitch With ball mount and shank has machine tapered round spring steel bars provide a smoother ride since they are forged longer. Positive latching operation is achieved through the interchangeable bars. Included are spring bars, ball mount, chains, hook-up brackets, shank and hitch pin, clip and bolt package for hitches that are adjustable. Various models are available for the distribution of 550, 750, 1000, and 1400 lbs. Select models include shank. 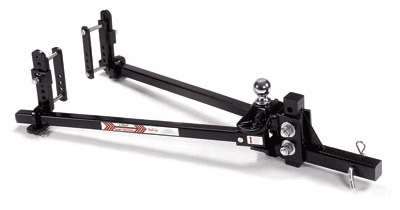 Eaz-Lift equalizing round bar weight distribution hitch With ball mount and shank has machine tapered round spring steel bars provide a smoother ride since they are forged longer. Positive latching operation is achieved through the interchangeable bars. Included are spring bars, ball mount, chains, hook-up brackets, shank and hitch pin, clip and bolt package for hitches that are adjustable. Various models are avaiable for the distribution of 550, 750, 1000, and 1400 lbs. Select models include shank. Round Bar Weight Distribution Distributing equalizer Hitch features a heavy duty round bar style, Weight Distribution Hitches, and heavy duty adjustable formed head. Also, the hitch bar is adjustable at the dimensions of 2" x 2". The springs bars are forged from solid steel and is wrapped in a rust resisting & corrosion Evergloss powder coat finish. Hook-up brackets are included. Quality and durability is a certainty. Various models are available for the distribution of 600, 800, 1000 lbs. Equal-i-zer weight distribution equalizer hitches are superior to any "add-on" friction bars or cam-type systems used with conventional or chain-style weight distribution hitches. Without weight distribution the rear of the tow vehicle can be weighed down resulting in hazardous Equal-i-zer weight distribution equalizer hitches are superior to any "add-on" friction bars or cam-type systems used with conventional or chain-style weight distribution hitches. Without weight distribution the tow vehicle's rear can be weighed down resulting in hazardous conditions. These include losing steering control, diffulty braking, and hitch Dragging. By providing proper weight distribution, Eqaul-i-zer brand hitches, ward off such hazards. Weight is safely distributed with ease to the vehicle's axles. Trailer sway is combated with 4-Point Sway Control exclusive to equalizer; a combination of four positive friction areas act simulatneaously act to prevent and stop trailer sway. High Towing performance made advanced. The Reese Pro Series Trunnion Weight distribution hitch includes built-in friction sway control which utilizes enchanced friction material, providing high control even in the most unfavorable of weather conditions! Included pad hanger brackets are adjustable and clamp for attaching, allowing for convenient placement on the frame of the trailer without unseating or re-adjusting batteries or LP gas tanks. The Reese Pro Series Trunnion Weight distribution hitch's unique head design makes it superior in strength yet easy to adjust. Installation is as simple and precise as removal is quick and easy since the hitch head is not only adjustable but has an elevated hitch ball platform. 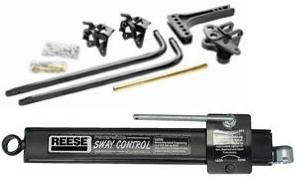 Setup is made easy with Reese's "serrated washer" design which allows for easy dialing. 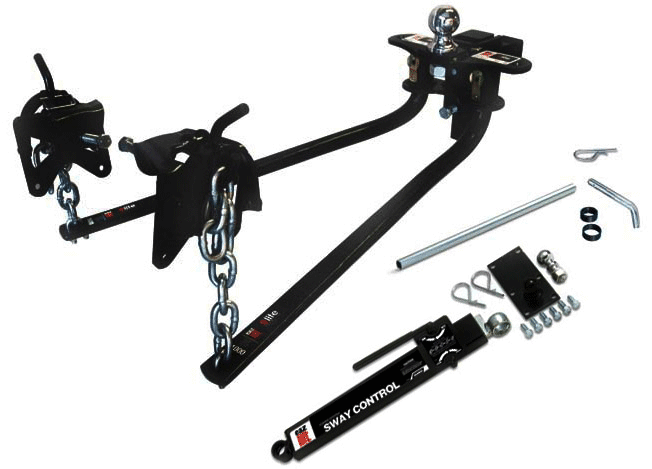 Reese Pro Series Weight Distribution Hitch & Sway Control RV Camper distributes 1200lbs and comes with a 5 year warranty. This complete adjustable weight distributing hitch bolt together system featuring simple adjustable blocks for effortless adjustment of the ball angle. It includes a one-piece cast head, snap-up brackets, chains, and spring bars with integrated cam. Induced sway is controlled by the friction sway control which uses friction to resist pivotal movement. The principle of "stiffening" is applied to the coupling between the tow vehicle and trailer which is suited by adjusting the "stiffening" or friction to accommodate various trailer weights and towing conditions. Operation of this mechanism is rather simple. Keeping the trailer and tow vehicle stable are friction brakes. Consisting of our patented Dual Cam High-Performance Sway Control, Weight-Distributing System, and simple installation, all in one package, is the Reese Strait-Line Hitch; an ultimate hitch by design and detail. Other hitches can't provide the driver control as this model does at such a price. This hitch acquired the name "Strait-Line" because the the trailer is literally forced by the pro-active design into a straight line behind the tow vehicle. It is fully automatic and self-centering as well as capable of manual adjustments of centerline with ease. Now offered by Ultra-Fab is one of the most rugged steel constructed weight distributing hitches available on the market, and it doesn't end there. Not only does it offer a secure tow, but a more level ride, allowing for more steering control and reduced braking difficulties. Included are head, an adjustable Hi low shank, and round bars with a tapered design. The maximum hitch capacity is 10,000 lb. The weight is balanced between the tow vehicle and trailer. Copyright © 2010 Distribution Hitch. All rights reserved.